To promote an enhanced quality of life and a safer community for all people in which to live. 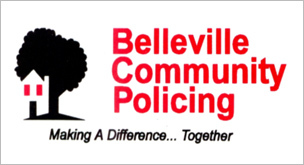 The purpose of Belleville Community Policing is to create and maintain a dynamic partnership between the Belleville Police Service and the citizens of Belleville through the sharing of ideas and addressing issues of common concern in order to preserve and enhance the quality of life in our community. We are always accepting new volunteers! Volunteer as much as little as you wish. Volunteer applications are available at the Belleville Community Policing Office or the Belleville Police Service. Volunteers can also print a copy of this form from within this web page. Simply fill out the application and then you will be contacted by the facilitator who will discuss the programs you are interested in volunteering time for. Stop by and pick-up a volunteer application today! Click here for a request for Volunteer Application Form.